Many parents feel nothing but fear and dread when faced with packing back-to-school lunches. It’s no wonder. We’re faced with finding healthy foods that kids will actually eat. (Raise your hand if the perfectly nutritious lunch you packed with love ever came back home untouched. While we, unfortunately, don’t have a magic solution for all your lunchtime woes, we do have four tips on how to make sure your kids’ lunch choices are healthy for their teeth. 1. Avoid sticky, gummy foods. This first suggestion gets to the heart of keeping teeth healthy while children are at school. Sticky foods like chewy granola bars, well, stick to teeth, and they are high in sugar. As a result, the longer they remain on teeth, the more plaque will form. Plaque, in turn, serves as the breeding ground for the bacteria that can cause tooth decay. Since kids most likely don’t have time to brush all this stickiness off at school, avoid packing them. Sports drinks and juice pouches are very popular with kids today, but they are hard on teeth! Even though some are slightly lower in sugar than soda, sports drinks are still very acidic. Similarly, many “juice” boxes and pouches are very high in sugar and acids. These acids, paired with sugar, can weaken tooth enamel. Your best bet is to pack water or plain milk. Many common snacks include refined carbohydrates, and these can be just as harmful to teeth as sugary candy. For instance, pretzels, little fish-shaped crackers, white bread, chips, and many kinds of pasta are made from white flour. In your mouth, they break down into simple sugars. They become soft and mushy, too, which makes it easy for them to get packed between teeth and in the small grooves on the chewing surface. In short, they make the perfect habitat for bacteria to grow and thrive in your child’s mouth. If you do pack some of these items in their back-to-school lunches, be sure to encourage your child to rinse their mouth thoroughly after with water to minimize the amount left on teeth. 4. Pack an edible toothbrush! When in doubt, encourage your child to drink plenty of water! Healthy back-to-school lunches are challenging, and if you’re like most parents, not every choice every day will be ideal. To help minimize the damage, encourage your child to drink plenty of water after lunch. The water will help wash some of the food off of teeth and keep acid levels low. And, of course, have them brush and floss well at home! 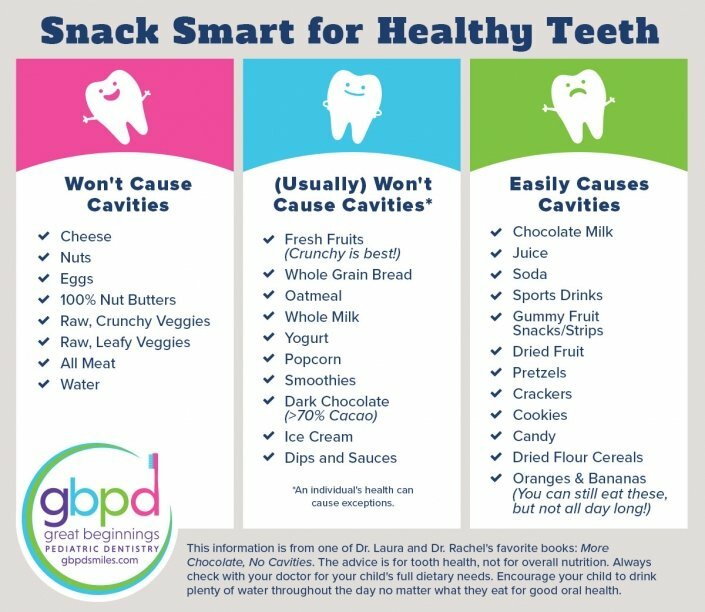 Dr. Laura Adelman and Dr. Rachel Rosen love discussing nutrition and other ways to help keep your kids cavity free. They are accepting new patients under 12 years of age. Call or submit an appointment request form to find an appointment time that works for you.